I finally found a reasonable Lithium Battery by Valence. 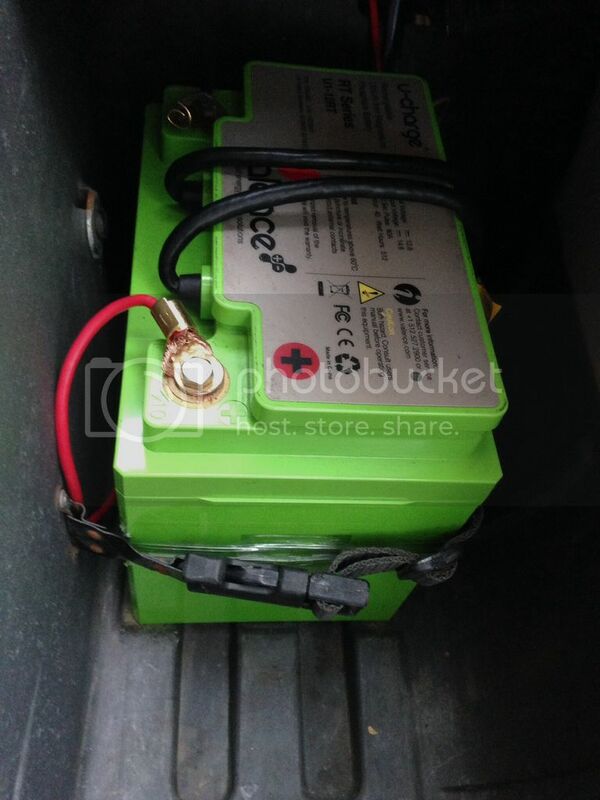 It's a rechargeable Lithium Iron Magnesium Phosphate 40 amp hour Battery from a medical cart. It weighs 15 lbs. First impression is very good, It started out stronger than my 60ah (40lb)AGM car battery and came on stronger after a 3 minute rest. It tested 13.34volts before and 12.92 after my 3 mile round trip. Total cost with shipping was $128. eBay US. It has pos/neg bolts and complicated cables I'm ignoring at present. There is a flashing green led on top and it has built in circuitry that shuts down the battery at 10 volts to avoid damage. I'm thinking of buying a second one to wire in series. I need to read more on charging but, the seller promised me I could use a normal car charger. I've read that Lithium 40ah is underrated and more like a 60-70ah but, this remains to be proven. http://s1066.photobucket.com/albums/u406/ftpstuff/?action=view&current=50e97a8db2039a7f6c8683d6121f4863.jpg" target="_blank"
[url= ] [/url I apologize the picture upload refuses to cooperate jpgs are no longer allowed"
Made another trip after the bike sat for a week with a full charge. Started with 13.28 volts and ended with13.08v. 2 miles. This time the power cut out 4-5 times but came back on after 10-20 seconds. Generally after a big bump. I'm thinking there may be a loose wire or short. Previously, I found a loose connection on the Chas wiring kit blue box. Does anyone recommend dialectic grease? Thanks Chas! I'll check out the connections and battery first. The valence has lots of features I'm not up on yet. Before i tied down the Heavy Battery, it died a couple of times when It slid and disconnected the blue box. So, the connector is probably loose. To get up to 3 hours of continuous use, should I plan on cooling the motor somehow?